Not every situation presents an easy slip-on opportunity. 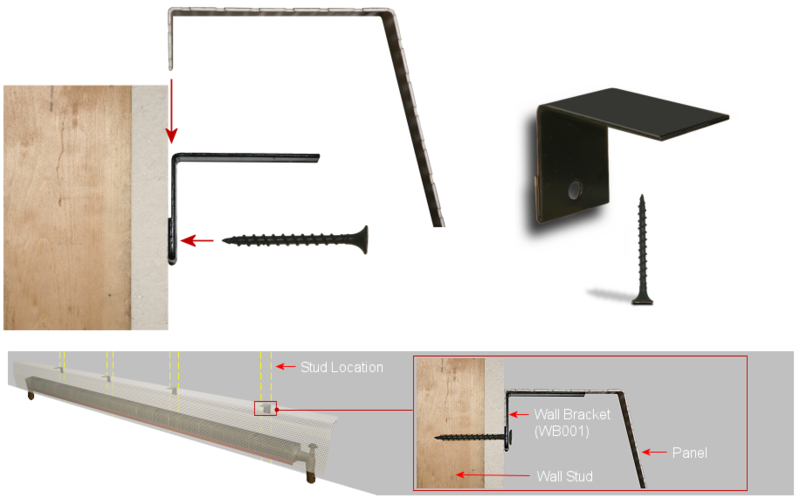 With this in mind, an easy to install wall bracket that comes complete with the screw, is the perfect mounting solution. Whether it's new construction with new finned tube element being installed for the first time or a total demolition of crappy old heaters, the WB001 wall bracket will ensure a proper secure installation. After checking the retrofitting guide for hot water baseboard heaters, your floor to top measurement (Step 2) is 7-1/4" or less. For whatever reason the back plate has already been removed leaving only the naked finned tube element exposed. You are a heating contractor and are installing baseboard heaters in a new construction environment. Locate a pilot hole to suit the No. 6 drywall screw (supplied) on each or every other wall stud. In an ideal situation the hole should be located at 7" above the floor. The vertical location of this hole will vary according to the circumstances of the project. For example brackets being mounted for use on a tall electric heater might be positioned at 9" off the floor. Once the pilot hole is drilled, screw in the bracket and ensure it is tight. A thin gap will be produced between the bracket and the surface of the wall as shown above. Slide the "lip" on the back of the panel down into this gap. WB001 wall brackets fit all of our size panels. Note: The black wall brackets are not visible when the panel is dropped in place.